There is alot of boat available in the Bayliner 3055 Ciera and with a motivated vendor we should see a quick sale ! Often seen advertised as the 3055 Sunbridge due to the raised area around the helm this Bayliner offers a great range of options throughout the boat. For the fisherman the recent addition of a stainless steel swim platform railing complete with bait table and BBQ mounts is sure to please and the deep and wide design of the rear cockpit will allow the keen fisho to spend their days chasing fish around the back deck or relaxing after a hard fight holding that fish of a lifetime sitting back on the lounge waiting for the flash to fire and capture the moment. If the family are not as keen of the fishing as you then they can relax on the sunbridge adjacent to the helm on a large lounge with table. Read a magazine, play UNO and offer words of wisdom to the hapless fisherman below. Drop the table and you have a LARGE sunbed, sit back with a cold drink and watch the world go by. Traditionally mounted to the STB side the skippers helm is spacious with plenty of room and great vision. Having recently had a new Lowrance Elite 7 fitted all bases are covered in navigation department. I stand over 6 feet tall and find the room in the saloon of the Bayliner Ciera series to be pretty good. Spread out in the 3 distinct areas of the cabin. Head forward to the bow for a double berth and access hatch to the bow, head aft and really stretch out on the transverse queen sized berth that folds away to an aft retreat or drop the dinette table and make a third distinct berth. Plenty of room and accommodation available and something not generally seen in a boat of 30 feet. The galley is fairly basic but will cover all bases for those that like to cook inside, offering plenty of storage is a key aspect and the Bayliner Ciera does that well enough. Powering this 1992 launched Bayliner are a pair of Mercrusier V8 / 5.0lt Thunderbolt stern drives pushing out 260 Hp per side. I have owned a boat with these motors fitted and they were reliable enough for me to fish 40 Nm off the coast without costing the earth to run. This should move along nicely with these engines fitted and with servicing carried out around Sept 2018 she is ready to go. For a boat of 25 years plus in age she is in good condition and there really is a lot of boat here to buy. A cheap weekender, a first step into overnighting or just some more room for day tripping to the islands. At around 32 feet overall the Bayliner Ciera 3055 has all bases covered. Call Ian on 0448 949 293 or Paul on 0427 949 293 We are here to help and are happy to arrange a suitable time to view this vessel. Are you considering selling your Yacht? 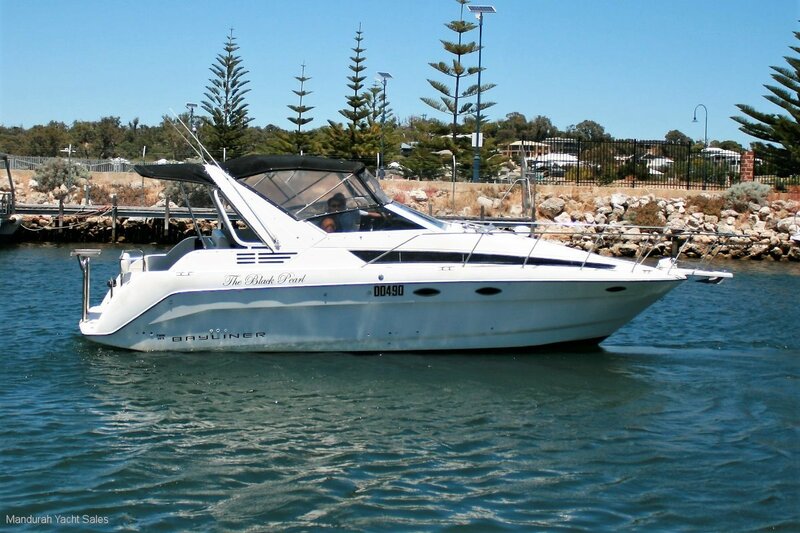 We specialise in Yacht Sales from Busselton to Mindarie and everywhere in between. A lifetime of sailing shared with every sale. Putting the wind in your sales! Up to eight in beds ! Where can you find a boat of just 30 feet with this many options in accommodation ? Room for mum and dad and all the kids. WE WANT YOUR YACHT !!! © 2019 Mandurah Yacht Sales. All Rights Reserved.